【SIZE & PACKING】One size fits all socks,easy to slip on as well as off,fits women size 4-8;4 Pairs cozy socks in Plastic Bag. 【QUALITY MATERIAL】This kind of super comfy fuzzy socks includes 80% Polyester, 15% Nylon, 5% Spandex, lightweight, soft, warm, thick & comfortable. 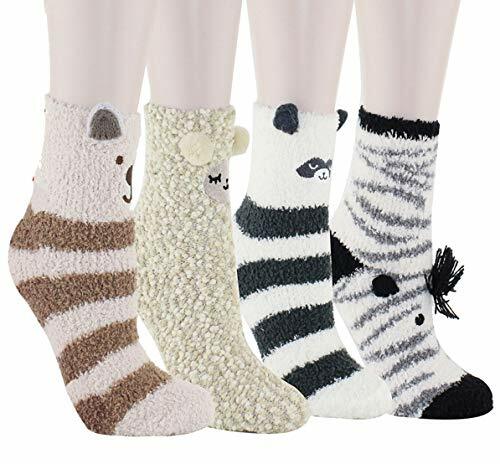 【CUTE PATTERN DESIGN】Sleep Sheep, Zebra, Cute Raccoon and Beige Bear; ;The cozy socks are perfect for any types of shoe, you\'ll be wearing unique socks each day. 【PERFECT GIFT CHOICES 】They could be your perfect gift choices for your beloved ones in holidays, like Mother\'s Day, Christmas, Thanksgiving and etc. Novelty birthday gifts for your mom, wife, daughter, girlfriend, grandma,sister. 【100% SATISFACTION】Shop with confidence. We provide full refunds & returns if there\'s any problem after receiving the product. Super comfy socks! These are really thick too, well made will last ages. Worth the money and look lovely on top. Would highly recommend this item to anyone of any age :) perfect product!